New 40k? 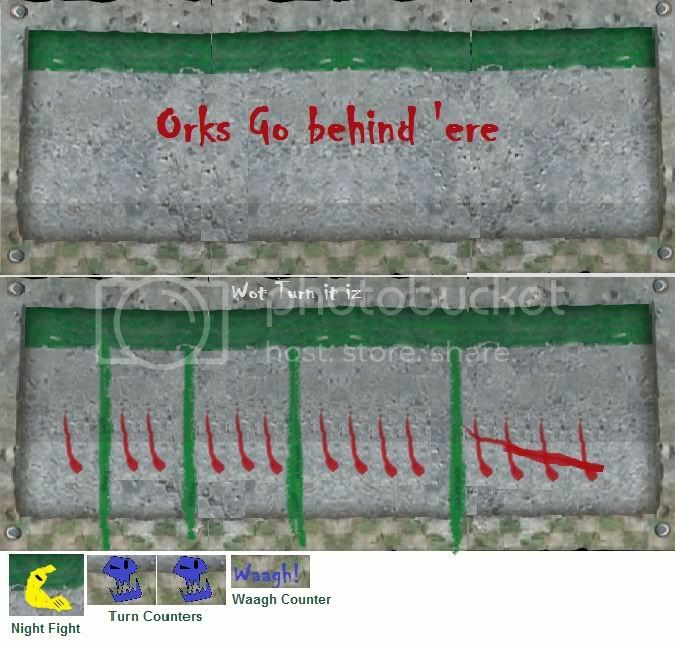 New Orky Gameplay Markers! The optimist thinks that we lived in the best of the worlds, the pessimist fears that it was truth. Just try and catch me, I'll enjoy driving my trukk over your dead body. dems brill boss, purfic fur da boys wen deys sloggin cross da battul place fur a scrap wiv da ummies an da beakie boys of an evenin!! I was wondering, could these be made to fit a 25 mm circle base? I thought I'd better link mekboy grokk's badmoon markers, before they fall off the radar. these things are good, just not too proppa in colour. We printed out and used some of these markers at Orkfest and found them to be exceptionally useful in such a large game. I had an idea and created a turn counter and deployment zone marker based on the marker's Grimteef made. :! And there ya go, you can slide the night fighting counter along the top, and the turn counter along the bottom. Nuffin' to see 'ere...moov along ya git! Oi Grimteef! Dis is some noice loot ya got 'ere. ^_^ Btw where dose wound markers be hidin'? Not sure if these will work. (Have yet to play a game of 6th.) But, I can change/improve them based upon feedback. Double post - forum did weird things that day... Reserved for future use. Have you even read the forum rules ? Posting thanks and stuff 3 and a half years after it was last updated!! Your haven a Zoggin laugh mate!